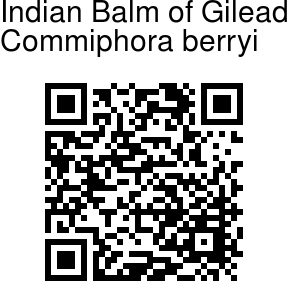 Indian Balm of Gilead is a fragrant, thorny tree, up to 10 m tall, but often grown as a bush. Bark is reddish-brown or grey; blaze pink-red; branchlets spine-tipped. Leaves are 3-foliate, or occasionally 7-foliate, alternate, clustered; estipulate; axis 6-14 mm, slender, grooved above, flattened at base, velvet-hairy; leaflets opposite, stalkless, laterals smaller, at branch-ends larger; blade 0.6-2 x 1.2-2 cm, ovate-obovate, obovate, ovate or nearly round, base wedge-shaped or narrowed, tip blunt, margin rounded toothed or entire, hairless, chartaceous; lateral nerves 3-5 pairs, pinnate, slender, faint, intercostae netveined, faint. Flowers are small, polygamous, deep red, pink or cream coloured, solitary or fascicled, in leaf-axils; calyx narrowly bell-shaped; lobes 4, shorter than the tube, hairless; petals 4, inverted-lanceshaped, apiculate; stamens 8, free, alternately long and short, inserted on the margin of the disc; filaments subulate; disc small, 6-8 lobed; ovary superior, ovoid, stalkless, 2-celled, ovules 2 in each cell; style short; stigma 3-4 lobed; ovules 2 in each cell. Fruit is a drupe, 0.8-1.2 x 0.6-0.9 cm, oblong or ovoid-subspherical, beaked; seeds 2. 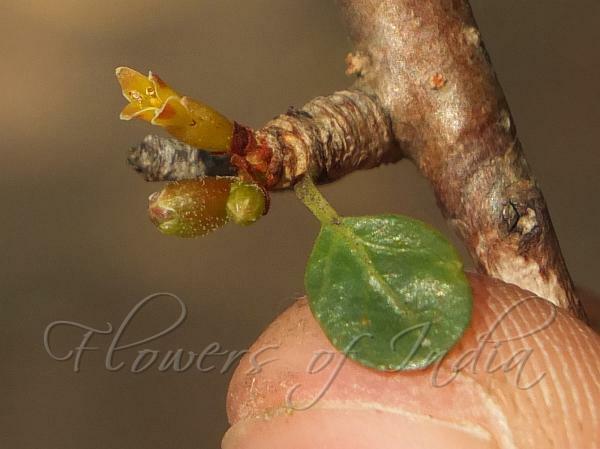 Indian Balm of Gilead is found in South India. Medicinal uses: The tree yields a fragrant gum resin obtained by incision of the bark. The resin is used in folklore medicine as an ingredient in multi-component indigenous formulations used as astringent, antiseptic, carminative, diuretic, appetite stimulator, uterine stimulant and emmenagogue.